2012 is the United Nations Year of Co-operatives. 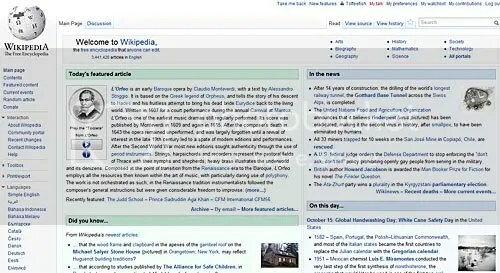 Wikipedia must be one of the largest websites in existence today. It is an online encyclopedia in which registered users can edit pages themselves, although it is moderated by a large groups of volunteers, each responsible for a section or subject. At the last count it contained over 340,000,000 pages! Anything you need to know, you can be fairly sure to find it on Wikipedia. Keywords on pages link through to other pages so you can browse the site for hours without performing a search at all. AdviceGuide is the website offering online help from the Citizen’s Advice Bureau. It offers a huge range of advice on subjects from immigration to how to cope in the recession to health, tax and the legal system. Available 24 hours a day, you will get the same impartial advice that you would receive over the phone or in a branch. The website can also be viewed in a range of languages. MoneyMadeClear offers impartial advice and online tools to help you decide what is financially best for you. 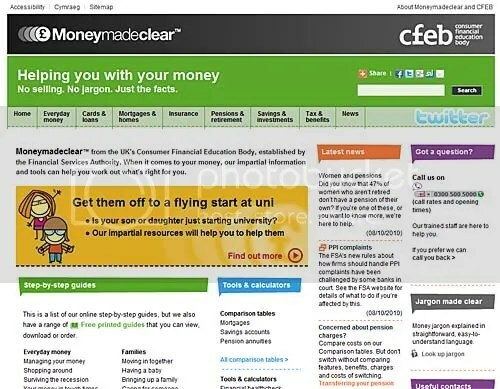 Run by the UK’s Consumer Financial Education Body, established by the Financial Services Authority, MoneyMadeClear is currently promoting advice to parents whose kids are going to university. MoneyMadeClear offers advice on all aspects of personal finance – mortgages, savings, pensions, credit cards, loans etc. and it’s all completely impartial as they’re not affiliated to any financial institution. The BBC has announced the launch of BBC First Click campaign to help people get online. BBC Connect is the website that will show you how to get involved, how to get other people involved and how to organise a ‘First Click’ session at your premises. It provides information on the basics of using the internet and provides a phone number that you can call to discover where your nearest training session is being held. The Communities 2.0 project run by the Wales Co-operative Centre in the guise of the Click.Connect.Discover campaign is a partner to BBC First Click in Wales. Today’s website of the week isn’t meant to alarm you, but to give you some sensible pointers about staying safe online. The team have provided advice and factsheets, case studies, news and alerts. 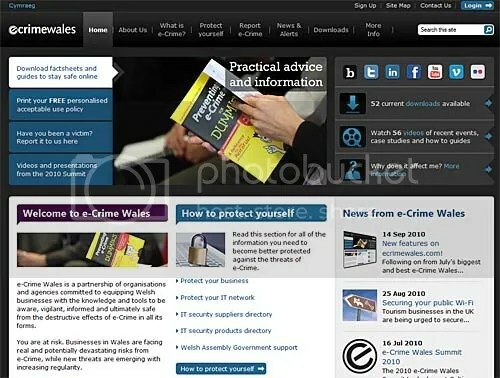 You can report e-Crime to them through the website. Have a say in the polls and statistics regularly quoted on TV news and in national newspapers. YouGov is not like other survey websites which offers money for you to fill in online surveys (although they do that too – at least 50p for a paid survey). They ask the UK public about a wide range of current affairs, brands, shopping habits, public opinions of particular MPs and other well-known characters. Companies can also pay to have their questions put in a survey from YouGov, so the surveys you take can be on a wide range of subjects. The results of most can be found on their website. You can also talk to YouGov directly via Twitter, giving them your opinion of the day about anything at all. Help have a say in the UK with YouGov (use the green buttons top right to create an account).